StoryNight Guests - Here's what to bring with you on Sunday or to note in advance - PLEASE READ!!! We may or may not have enough chairs for our guests. Bring a light-weight folding chair for each attendee just in case we have a large last minute turnout. The first to arrive will get use of the available chairs. If the ground is sufficiently dry by Sunday, another option is to bring an outdoor blanket instead, assuming you and your guests will be comfortable with that. A lantern with a battery or solar-powered bulb and/or a flashlight. NOTE: for safety reasons, no flame candles are allowed at this event!! It will be dark at 7pm when we start the program, and you will want to have your own light to navigate around the park. We'll have lots of lanterns around the site, plus a generator and lights that will be in use during the dance recital. After that, we hope to turn off the generator, and enjoy a non-electrified evening. A rain slicker and umbrella, in case of a change in the weather to light rain. Comfortable walking shoes, especially if you plan to take the river & poetry walk with us. 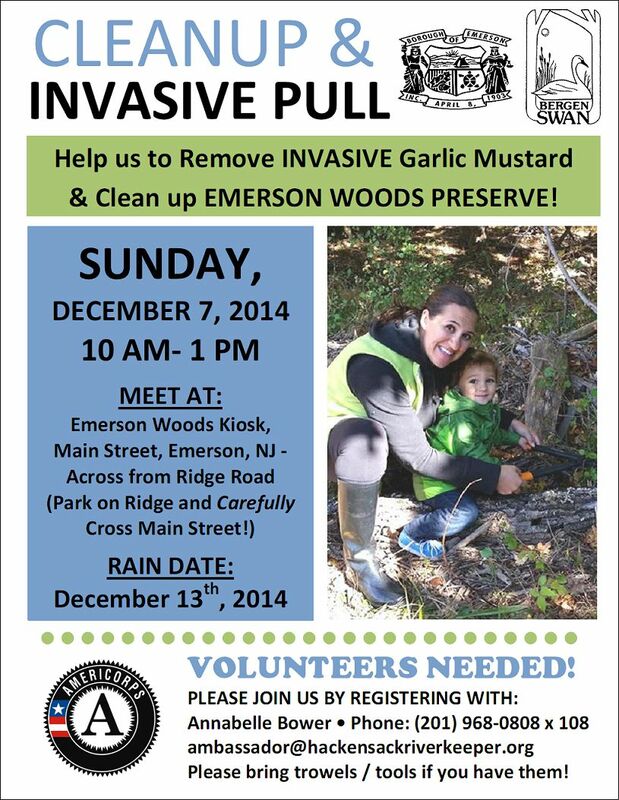 We will have all-natural bug repellent at the registration table, but bring your own if you prefer. 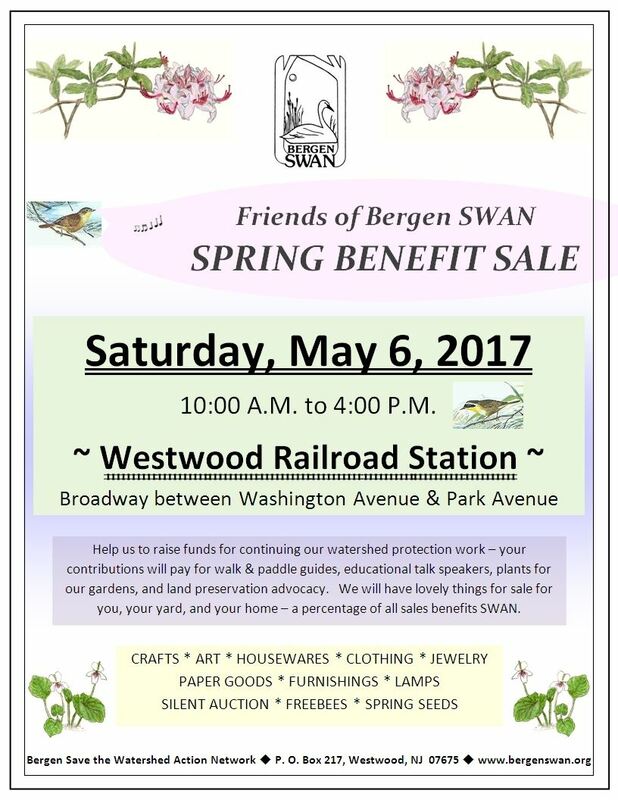 Checkbook - admission fees and silent auction/sale table items may be paid for by cash or check payable to "Bergen SWAN." Hague Park is on Grove Street, a side street off Oradell Avenue. It is at the corner of these two roads, within walking distance of town. Please park on Grove Street. 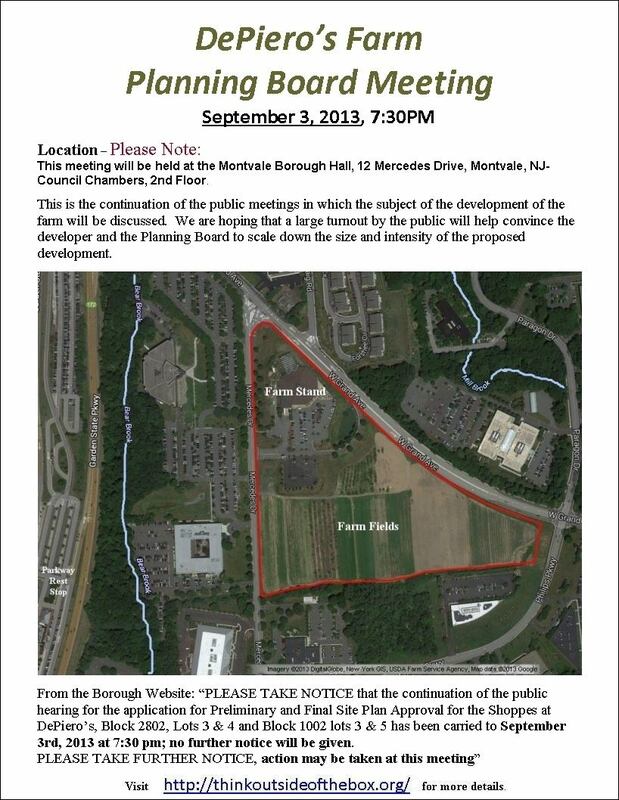 See a map of Hague Park at this site: https://www.co.bergen.nj.us/about-bergen-county/calendar/location/20-hague-park . 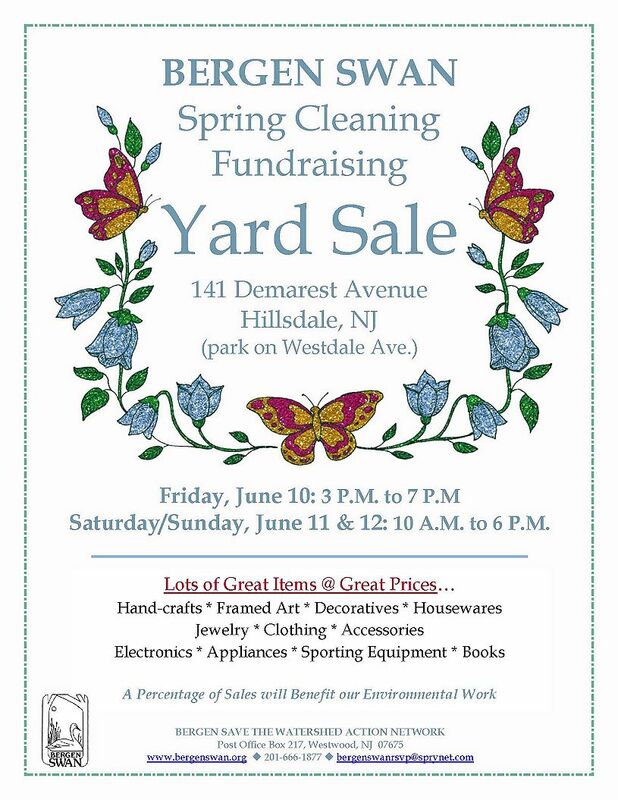 Directions: From the traffic light at Kinderkamack Road and Oradell Avenue, turn east on Oradell Avenue. Pass a few shops on your right on the south side of the street, then pass Maple Avenue and the RR tracks/station, cross over a bridge, pass a large white house set back from the road, put on your right turn signal, and turn right onto Grove. 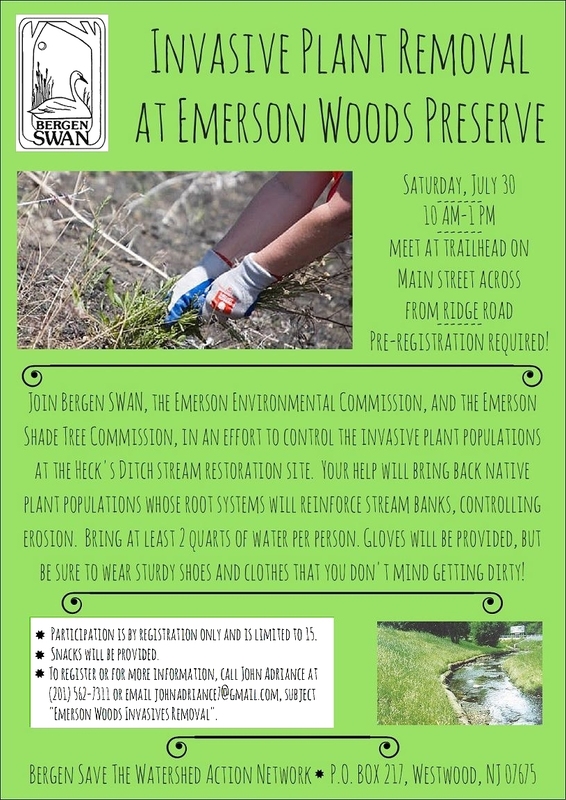 In case of rain or extreme dampness or wind, we will move our event to the Westwood Railroad Station, located in Veterans' Park, off Broadway between Washington and Park Avenues in Westwood. Please park on surrounding streets if the spaces at the park are all filled. 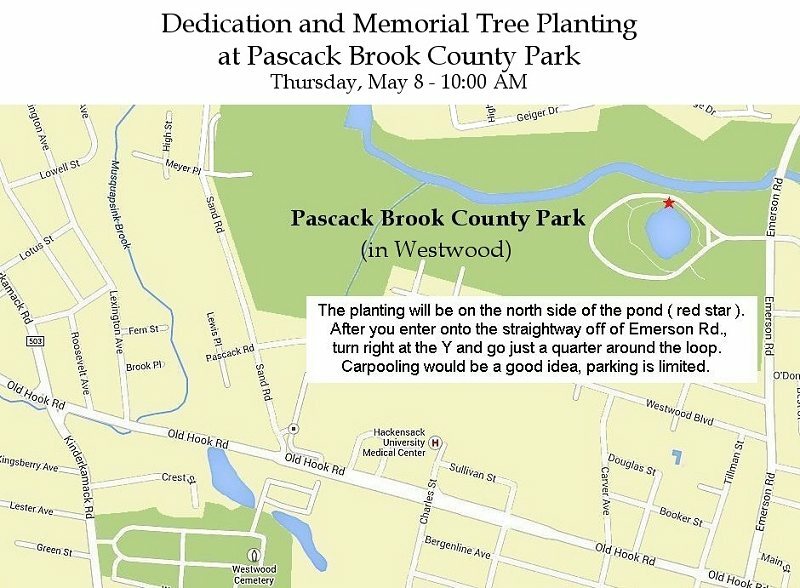 See the map at this website: https://www.mapquest.com/us/new-jersey/veterans-memorial-park-267722654 . Pre-registration - even at the last minute AT Hague Park or Westwood Station - is mandatory for our insurance purposes! You will need to sign in with our volunteers at the registration table. Please give your name, email address, phone number, and how you heard about our event, and provide your donation. Don't forget to enter our free raffle! There is no running water or electricity at Hague Park. We have rented a portable lavatory that will be located at the Oradell Avenue side of the park. The unit will have a battery-operated light within. 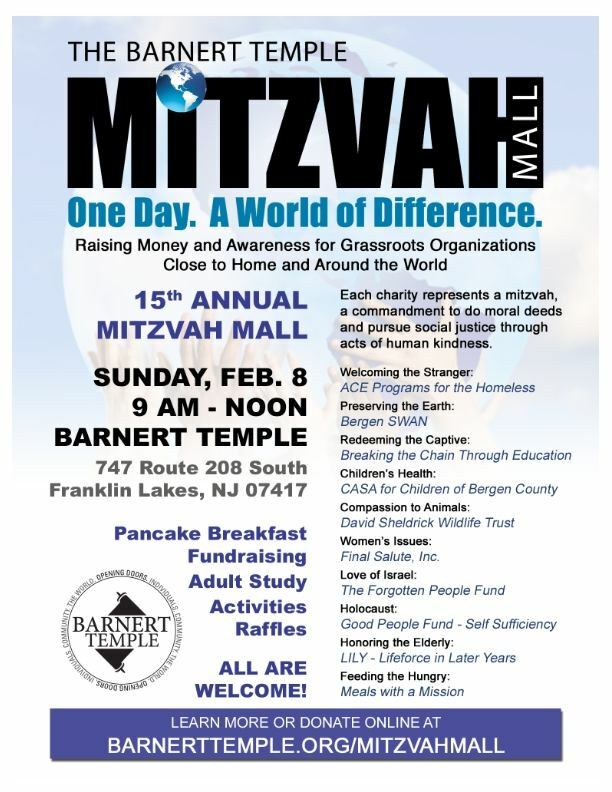 If we have a spare volunteer, we will assign them the task of shuttling our guests who cannot manage the port-o-potty to the nearest conventional restroom, located at the Oradell Railroad Station on Maple Avenue (one long block to the west of Hague Park). If we are short on volunteers, you may have to walk or drive over to the RR station restroom. 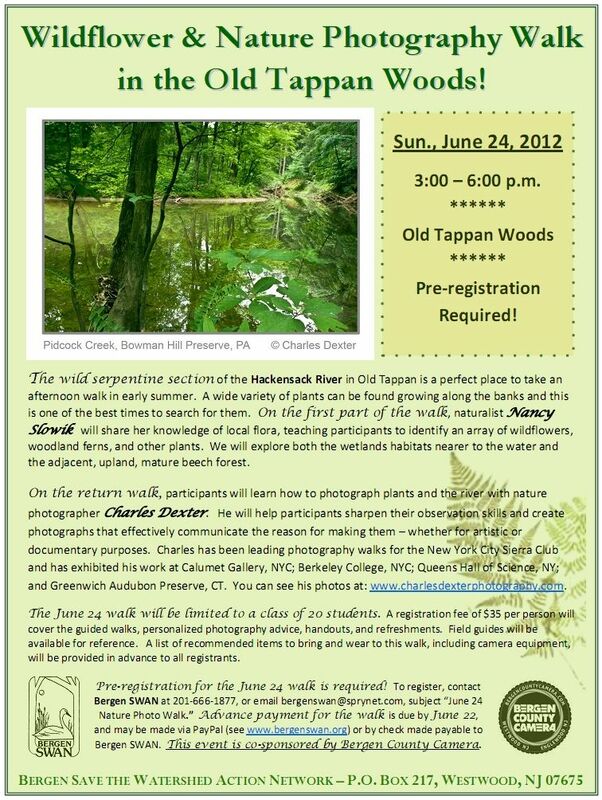 After the story portion of our program, we'll be gathering everyone to take a short walk over to the bridge on the Hackensack River - it is to the west of Hague Park and right near the Oradell RR Station. We hope you will stay with us for this! 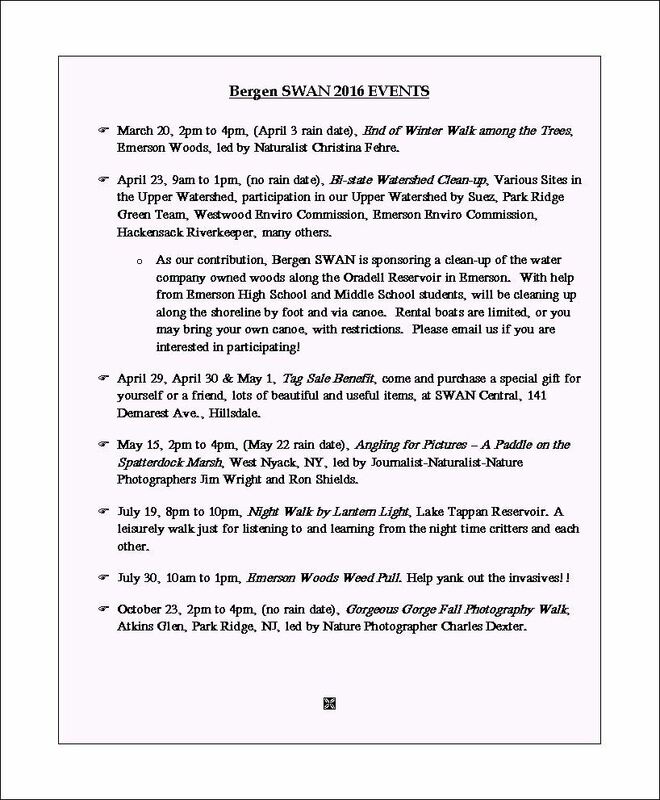 We will be led by our musician and dancers to the bridge, where several friends of SWAN will pay tribute to SWAN's late and much missed Co-Director, Mark G. Becker, by reading some beautiful river poems. Our event may run late since we have a lot of activities planned! We hope you can stay for the entire program! In any case, if it takes place in Hague Park (as vs. Westwood RR Station), the event needs to conclude no later than 10pm, as per Oradell ordinance. 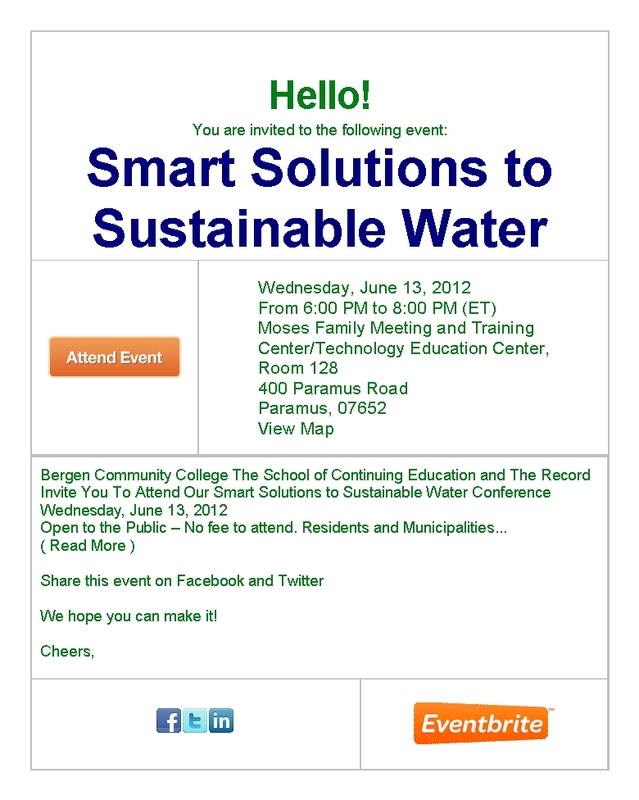 Please contact us in advance should you have any questions or concerns: 201-666-1877 or bergenswanrsvp@gmail.com. Can't make it to the 2015 Oct 17 Fundraiser Sale? Our online fundraising sale continues, where there are still scads of wonderful items available! 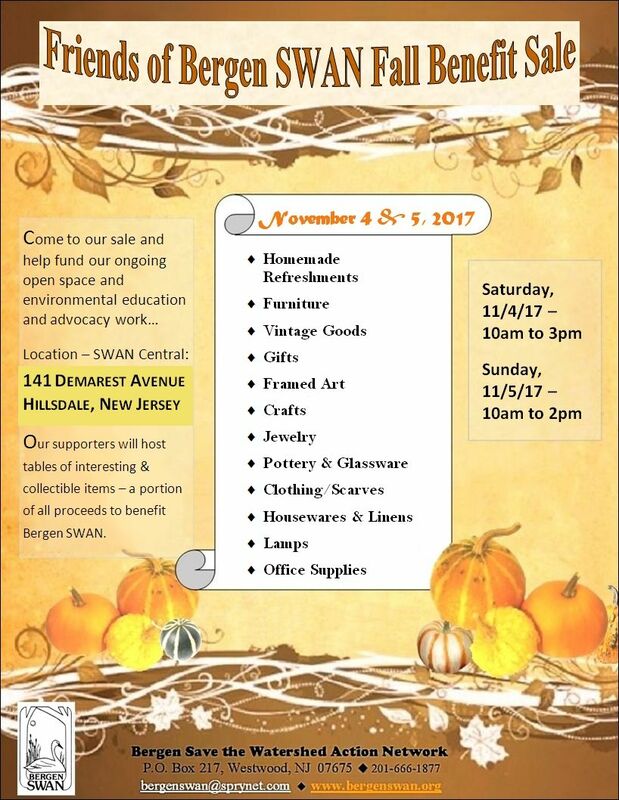 To download a copy of the above flyer, see the "2014 Bergen SWAN Fall Fundraising Sale" category on our Resources page. 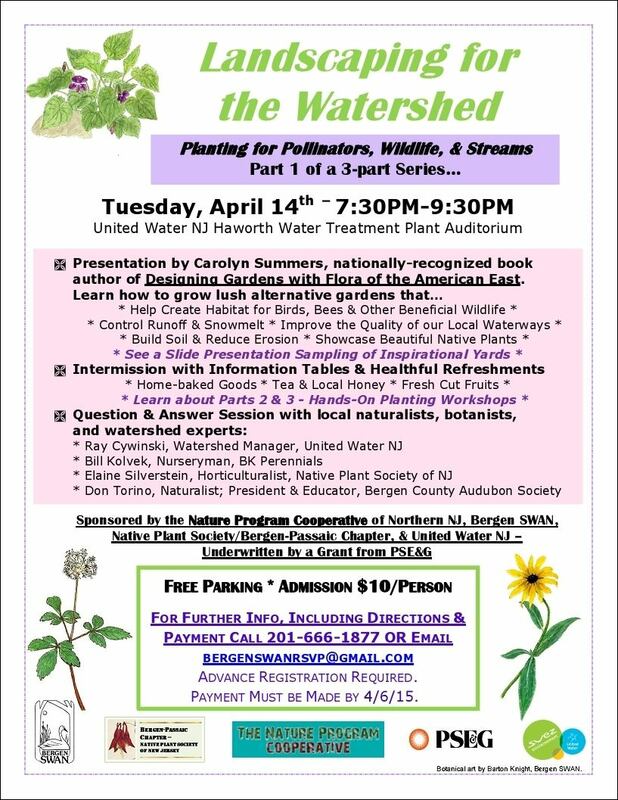 Go to the "2014 Hackensack River StoryNight" category on our Resources page to download a copy of the above flyer. 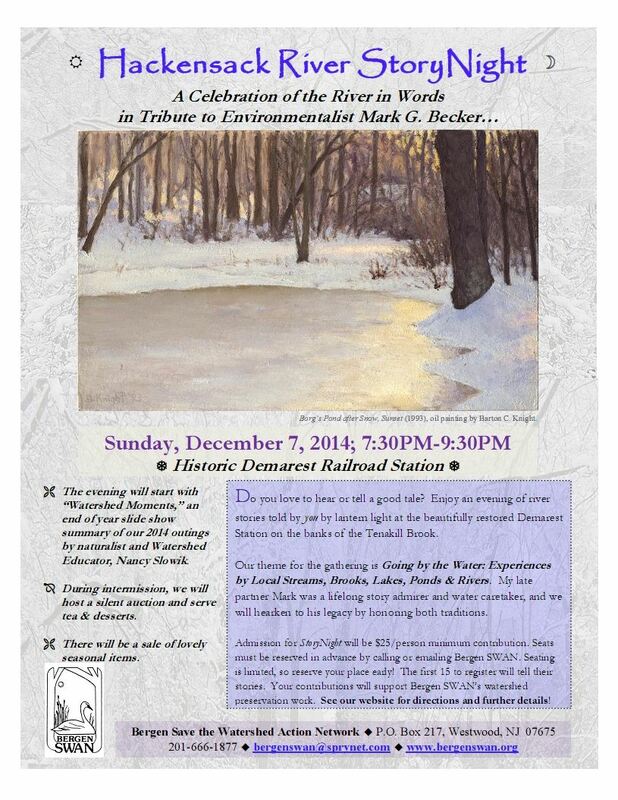 The Demarest Railroad Station is on Park Street, just off Hardenburgh Avenue. 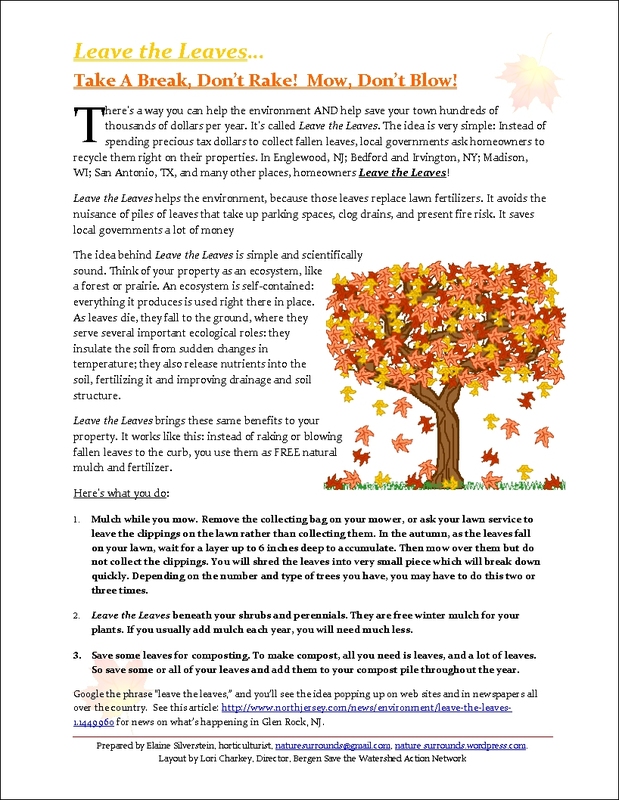 Go to the Resources page for a fact sheet with questions and answers about the proposed Green Acres measure. 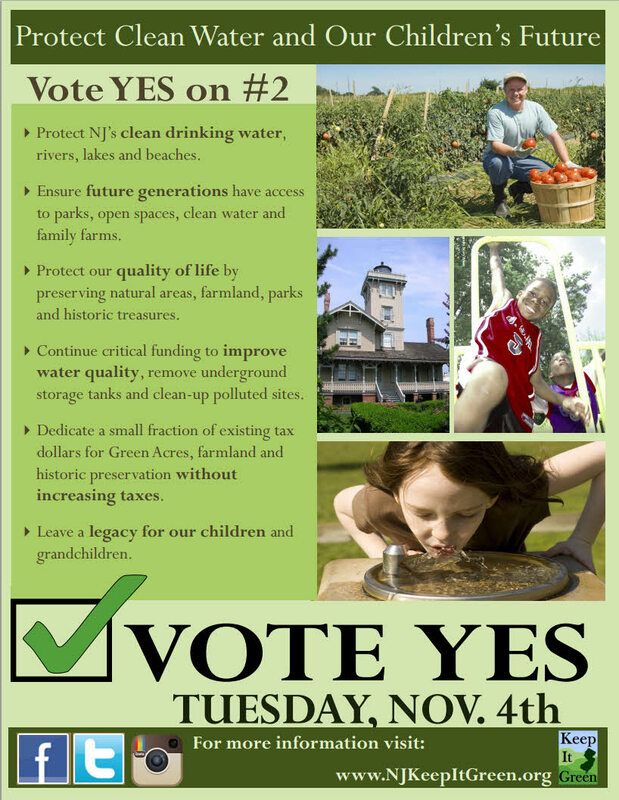 NOTE: To download a copy of the above flyer and the fact sheet, see the "Green Acres Vote 2014" category on our Resources page! 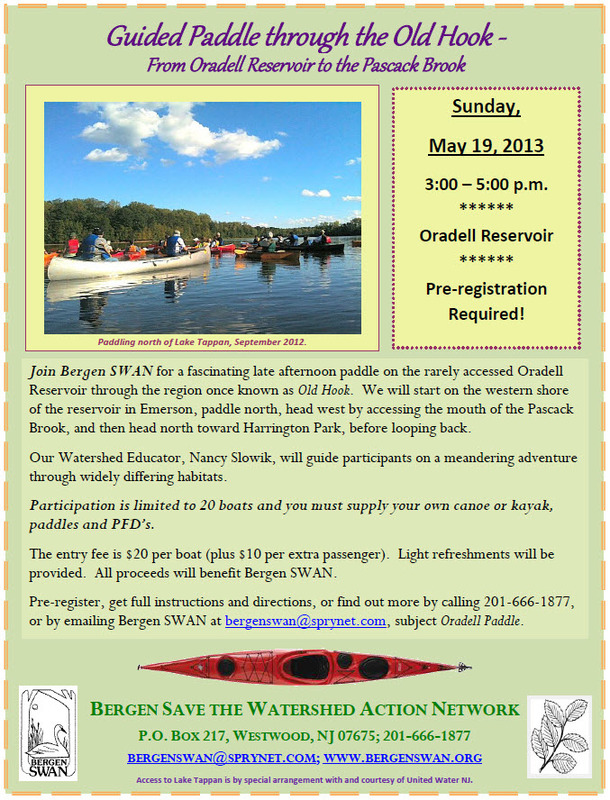 NOTE: To download a copy of the above flyer, see the "Afernoon Paddle at 40 Foot Hole" category on our Resources page! 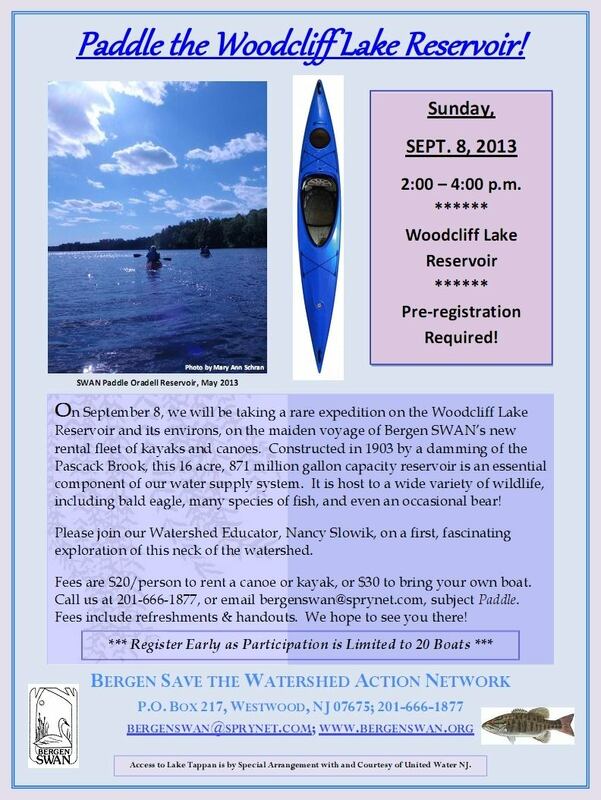 NOTE: To download a copy of the above flyer, see the "Lake DeForest Paddle" category on our Resources page! ATTENTION! 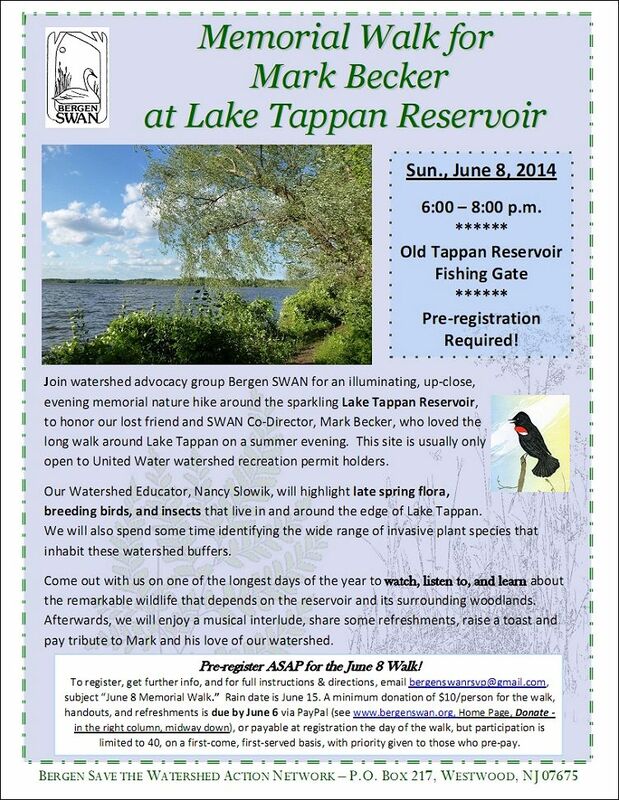 As of Thursday, June 5, 2014, our walk around Lake Tappan is fully booked!! 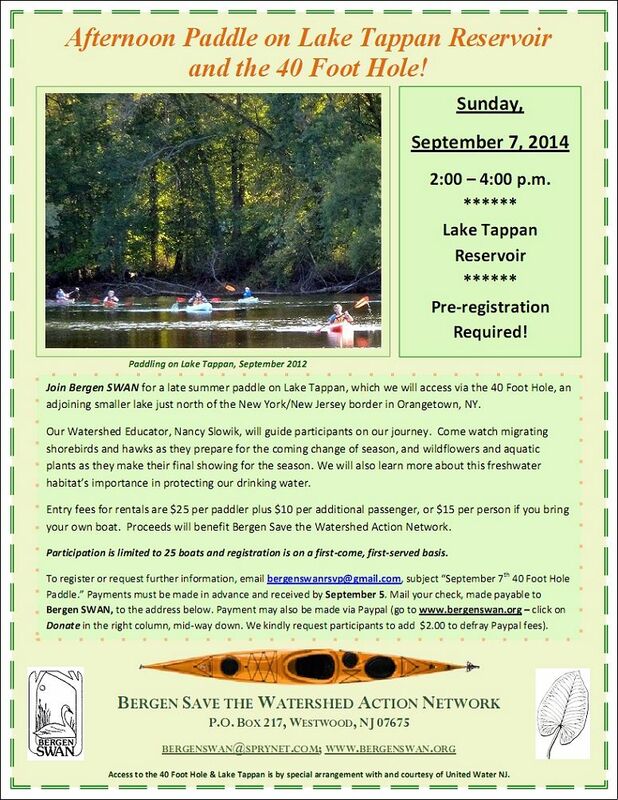 Please email bergenswanrsvp@gmail.com if you want to be added to our wait list! It is important that you do not go to the trouble of coming to the walk site without first hearing from us that there is an opening on our guest list. 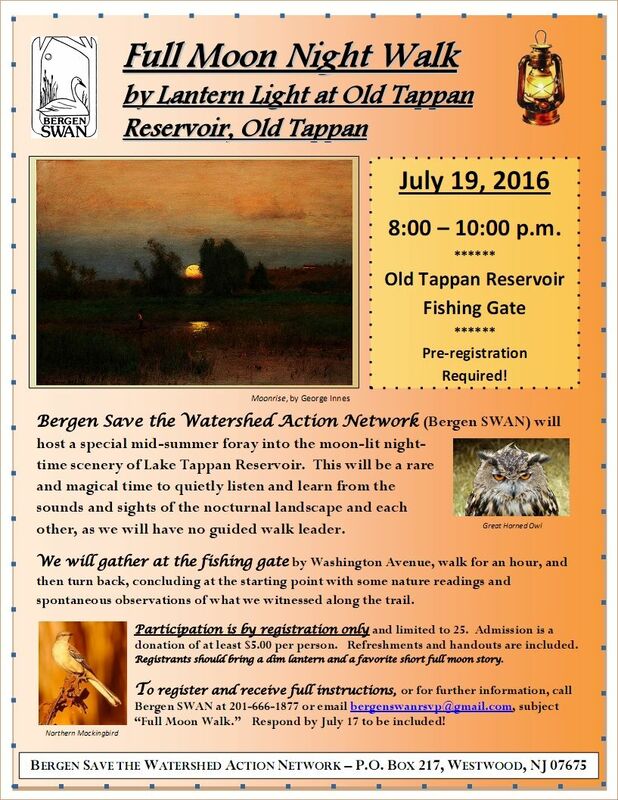 NOTE: To download a copy of the above flyer, see the "Lake Tappan Memorial Walk" category on our Resources page! NOTE: To further clarify our paddle pricing policy - our fee is $20 per boat with ONE person paddling it, plus $10 additional for each extra paddler or passenger. For example, a boat with two paddlers would pay $20 + $10, or $30 total; a boat with two paddlers plus one passenger in the middle would pay $20 +$10 +$10, or $40 total. Our pricing reflects the costs of hiring our naturalist and paying for insurance, refreshments, printing, and many auxilliary expenses. Thank you for your understanding! ALSO PLEASE NOTE: The Updated information on the Home page - date change on account of rain to May 26th. 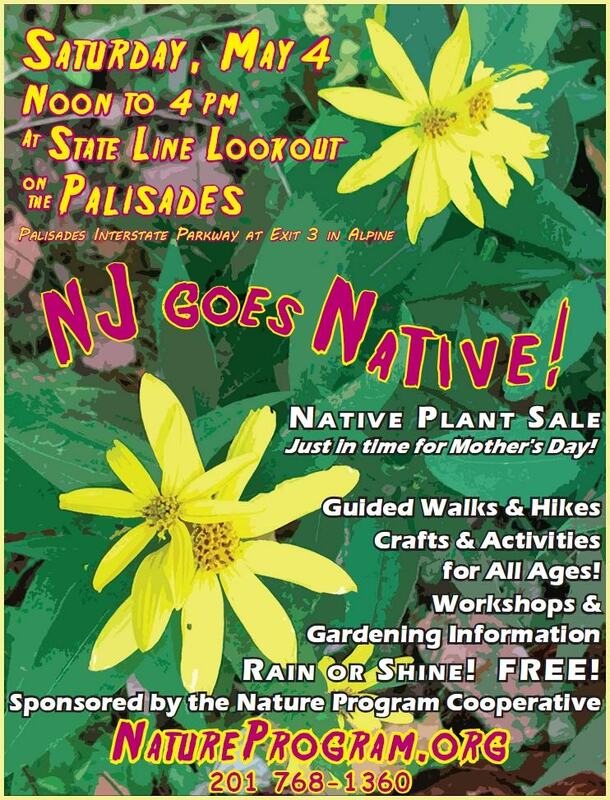 The walk will focus on plants endemic to the Palisades ridge and their unique association to the geology, in addition to other plants found along the way. Hiking conditions are easy with a moderate descent on a stone staircase to Women’s Federation Monument. 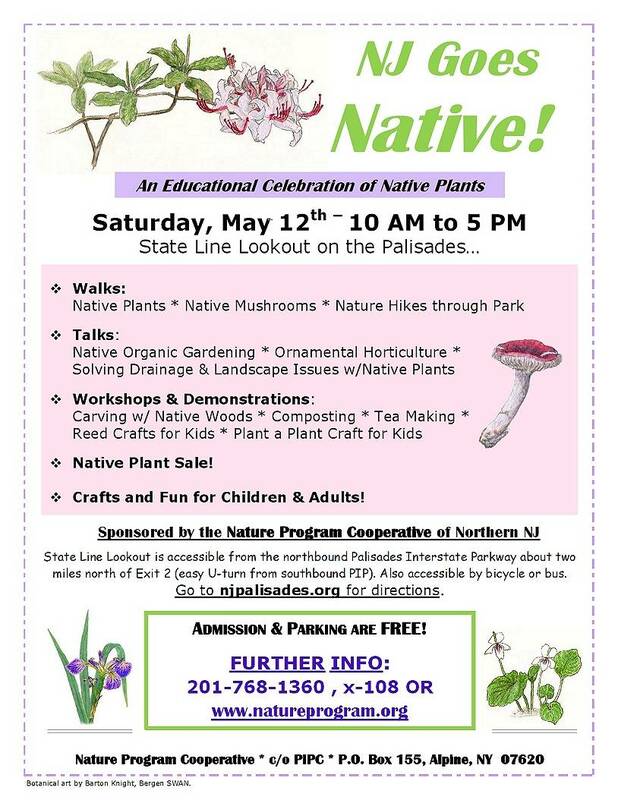 Nancy Slowik has been leading natural history walks on the Palisades for more than 20 years with expertise in identifying and propagating native plants. 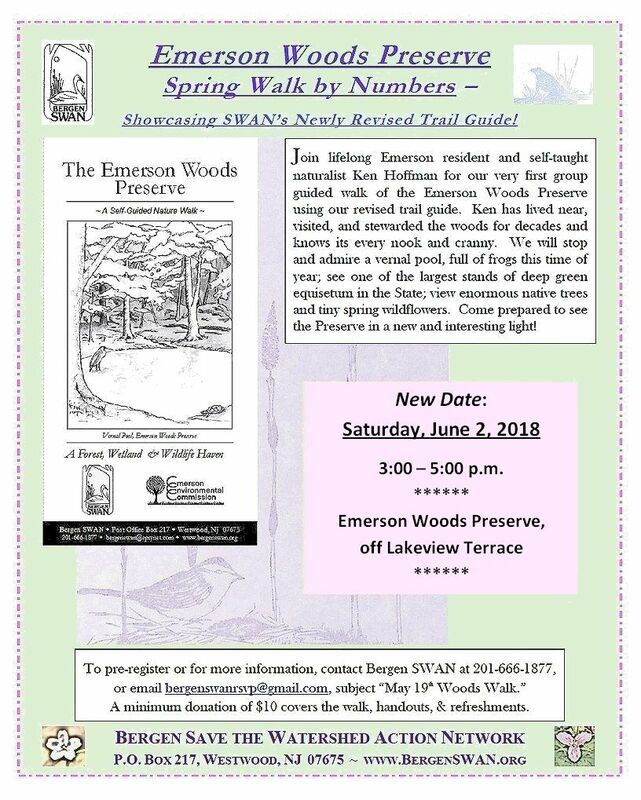 She is currently on staff at Hudsonia , a biological field station at Bard College, leading walks for Bergen SWAN and teaching adult education classes at New York Botanical Garden. 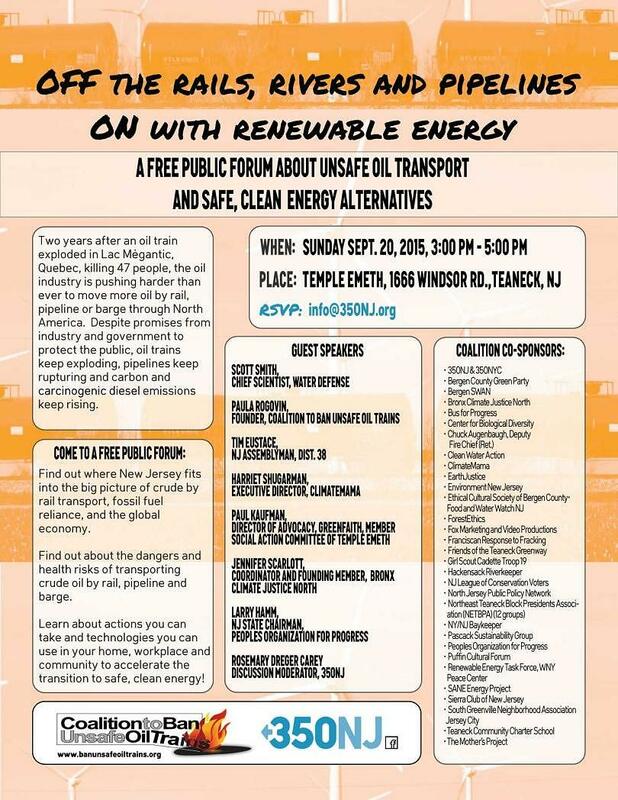 The flyer below is available as a PDF for download and printing! Click HERE! Because of inclement weather, the following Winter Walk has been rescheduled to take place on the 1st of January, same time and place. 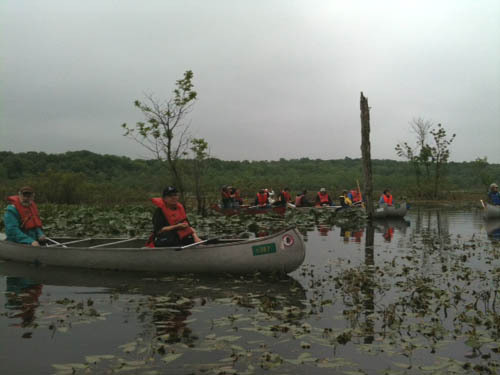 On Sunday, May 22, over 40 participants paddled back in time to experience a primieval marsh that still exits in our Hackensack River Valley. 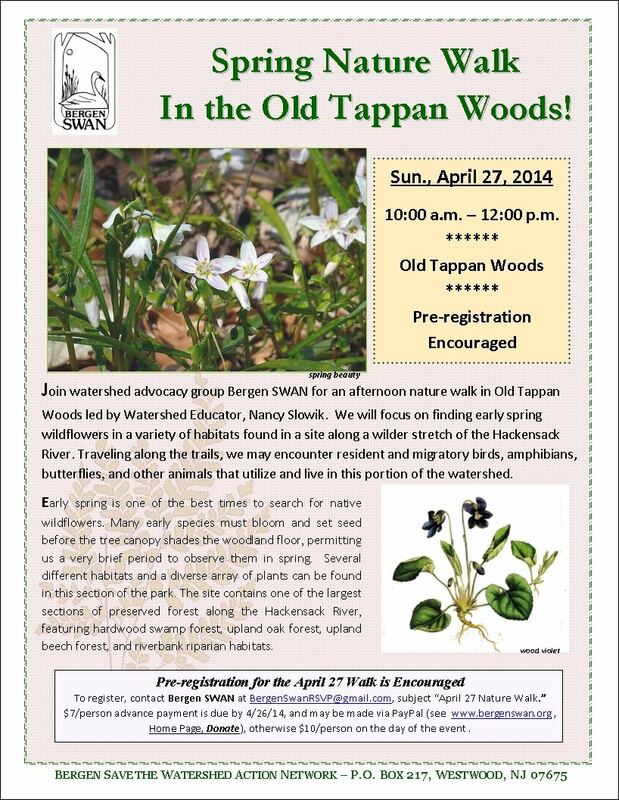 The Spatterdock Marsh is 300 acres of freashwater marsh that lies between Lake DeForrest and Lake Tappan. It is a splendid and mysterious landscape that provides a home to a vibrant wildlife community. 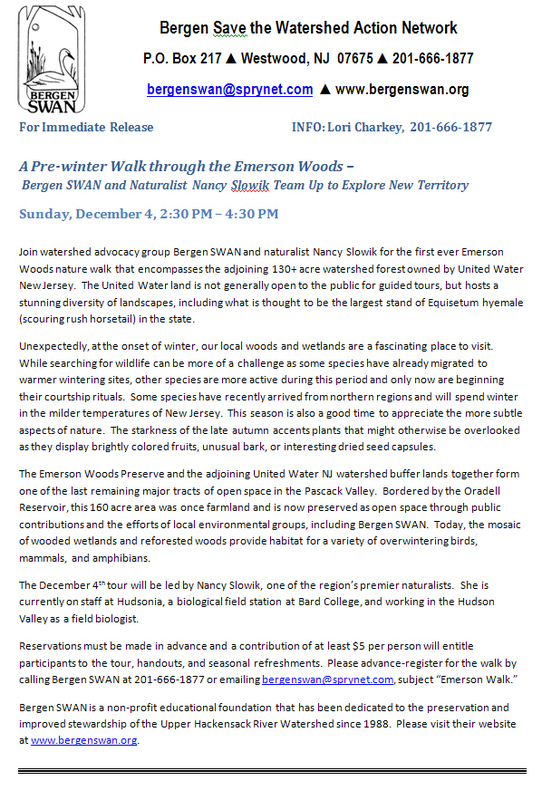 Nancy Slowik, a naturalist with Hudsonia, and Ray Cywinski, the watershed manager for United Water New Jersey, led a two-hour guided tour of the region. 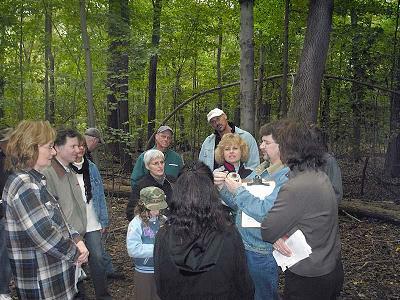 To close the event, local historian Daniel Wolff gave a poignant talk on the how the original Lenape inhabitants of the area survived in this landscape and how they and we have both struggled to live in balance with nature. Highlights from our guides are presented below. Click here for photos of the paddle. Wetland habitats found along this stretch of the Hackensack include a narrow portion of the river that flows into an expansive freshwater marsh and eventually empties into a lake. The marsh functions as a transition zone between open water and dry land, where a variety of wetland plants can be found, including the bright yellow flowers of the spadderdock water lily taking root in this shallow wetland. 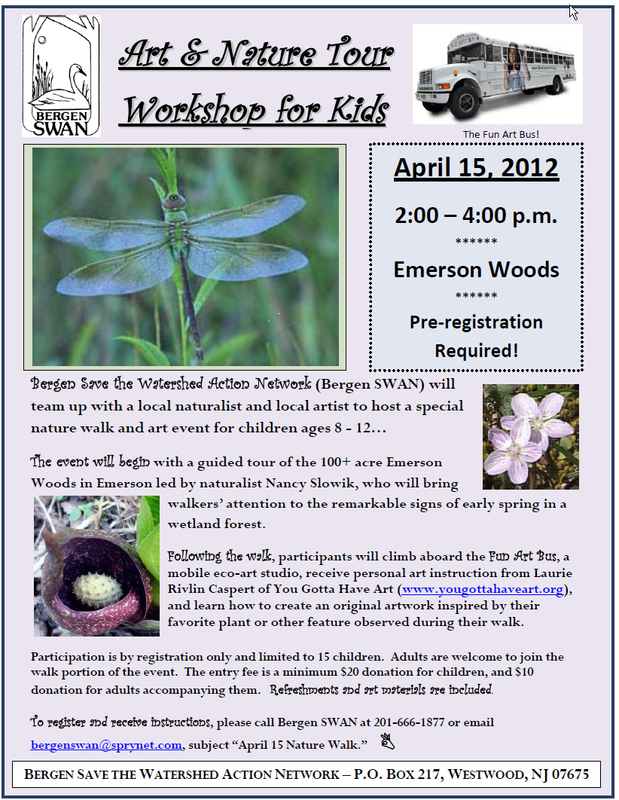 Plants such as bur-reed, pickerel weed, buttonbush, rose mallow, iris, rushes, sedges, and grasses can also be found here. Tree species found growing along the river bank include red maple, pin oak, green ash, slippeary elm, box elder, and willow. Also present was water chestnut, an invasive plant species that can dominate the wetland. A number of bird species utilize this portion of the Hackensack River during migration as a temporary stopover or as a wetland habitat to breed. During a pre-event scouting expedition on May 13 and on the May 22 canoe trip, we observed the following species: red-tailed hawk, osprey, wood duck, black duck, mute swan, great white egret, great blue heron, belted kingfisher, tree swallow, chimney swift, barn swallow, Baltimore oriole, red-winged blackbird, common grackle, yellow warbler, common yellowthroat warbler, warbling vireo, scarlet tanager, rose-breasted grosbeak, American goldfinch, and a secretive wren yet to be identified. One of the most interesting species found was the shell of a freshwater mussel that was later identified as an eastern floater (Pyganodon cataracta), a common species of lakes and ponds in eastern North American according to Dave Strayer of Carey Institute. Probably a raccoon had cracked open this bivalve for dinner, indicating the presence of mammals. 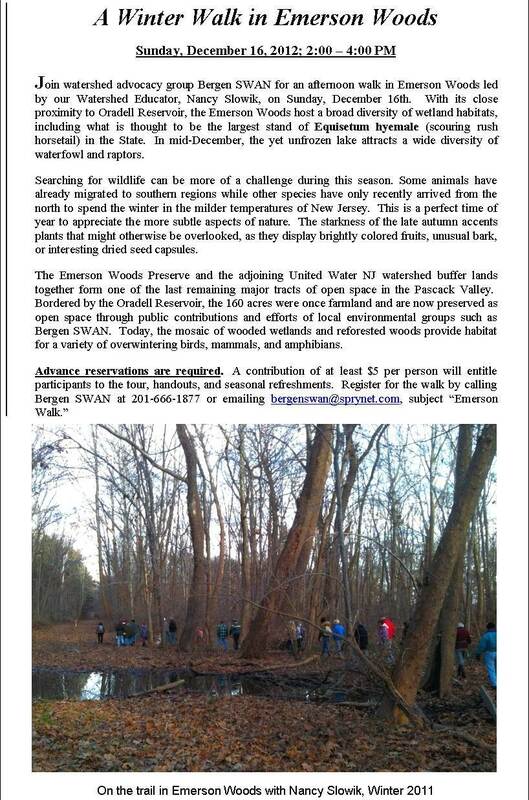 * The northern Hackensack runs in a natural, marshy water basin between the Ramapo Mountains and the Palisades. * Evidence shows a human presence in the valley some 10,000 years ago, along with mastodon and mammoth. * Native inhabitants probably fished the Hudson in the spring and came back into the warmer, more protected Hackensack Valley during the fall and winter. 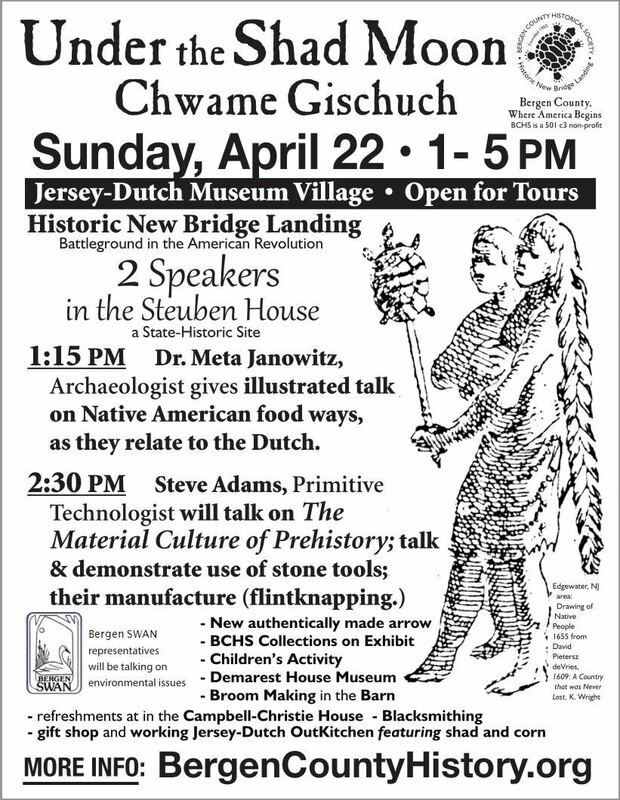 * Lenape and other tribes needed an acute knowledge of nature to survive, including a belief system that maintained a balance between human and animal needs. * Given the intense population demands on the Hackensack, humans must develop an unprecedented awareness and conservation ethic to continue living along its banks. The water and watersheds we take for granted are the theme of a current art show at the Haworth Municipal Library. 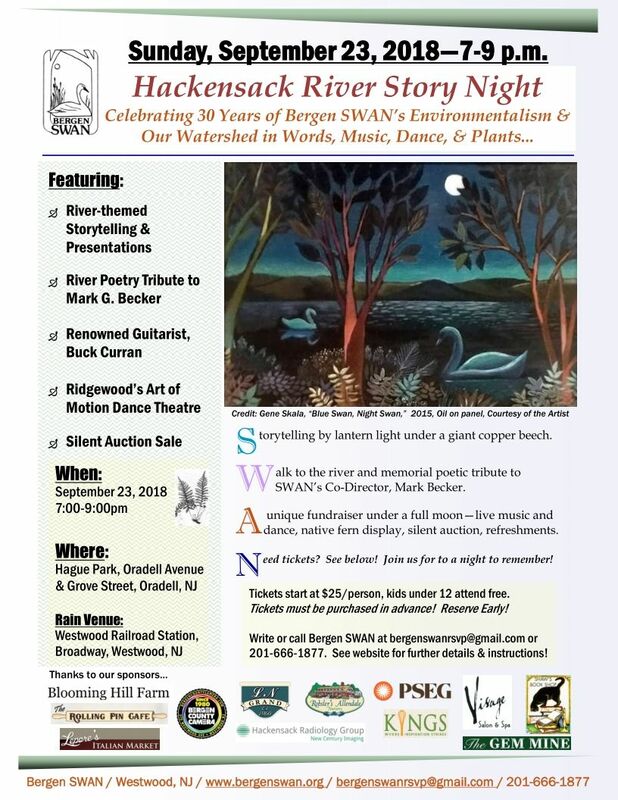 Brought together for a recent Bergen SWAN evening celebrating the Hackensack River – Hackensack River StoryNight - the exhibit will be up through the month of October, with a closing reception on Saturday, October 30 from 12-2 pm. 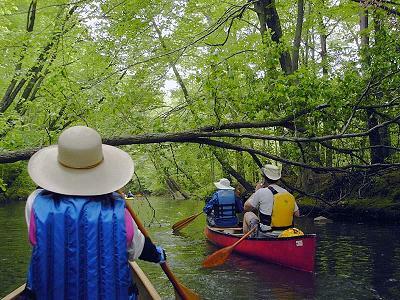 The exhibit celebrates the waterways and woodlands of the Hackensack River Watershed, from Lake Lucille in New City, New York through the Meadowlands and Newark Bay in New Jersey. Artworks that depict the river, its tributaries, and natural areas were given preference, but works inspired by other regional rivers were also included. The camera’s ability to capture water in its many moods makes this exhibit rich in photography. There is a wide range of photographic practice. Among the many distinguished entries from all over the region, two photos by Steve Burns display the beautiful colors of sunset and a blue misty morning on the Oradell Reservoir. Hildi Borkowski is represented by a panorama of marshes but has also focused her lens on a seagull. Haworth resident Nancy Wysocki has two views of the Hackensack near Secaucus. Laurie Seeman of West Nyack NY lives on the shores of Lake DeForest and is represented by two black-and-white photographs playing the texture of rippling water against the rough texture of burlap. Residing south of her in New Jersey, Lori Landau has entered her impressionistic photographic musings that focus on the play of light and wind on the reflective surface of the Saddle River and other waterways. Bergenfield resident Tim Dingman is represented by black-and-white photos of the lower reaches of the Hackensack, some featuring mighty steel bridges. In yet another black-and-white photo that has a touch of surrealism, Melchior DiGiacomo shows in a large format work, a boy sleeping on a dock by the Hudson - the Twin Towers in the background. Frank Palaia, formerly of Jersey City, now lives in the mid-Hudson area, and his photographs document the new walkway over the Hudson and other important upstate water sites. Paintings are also well-represented, with artists depicting rivers, lakes, and reservoirs in styles ranging from photorealist to abstract. Barton Knight has a group of small works that capture the quiet mood of water in several local woodland settings. The realism of these skillful and jewel-like works carries with them the introspective spirit that watersheds still inspire in all of us. Some of this spirit is also captured in Celine Ennis’ translucent small encaustics, while Adele Grodstein's waterscapes celebrate the energy of its colors in different lights with virtuoso application of oils. A more abstract view of the watershed is depicted in the dynamic works of Ellen Reinkraut, Cyn Bird, Frank Ferrante, and Ruth Bauer Neustadter. There is a lot of talent here: Frances Wells has contributed oil paintings, while iridescent acrylic paintings represent Stephen Horowitz. A monoprint entry by Rhoda Prochter rounds out the exhibit. 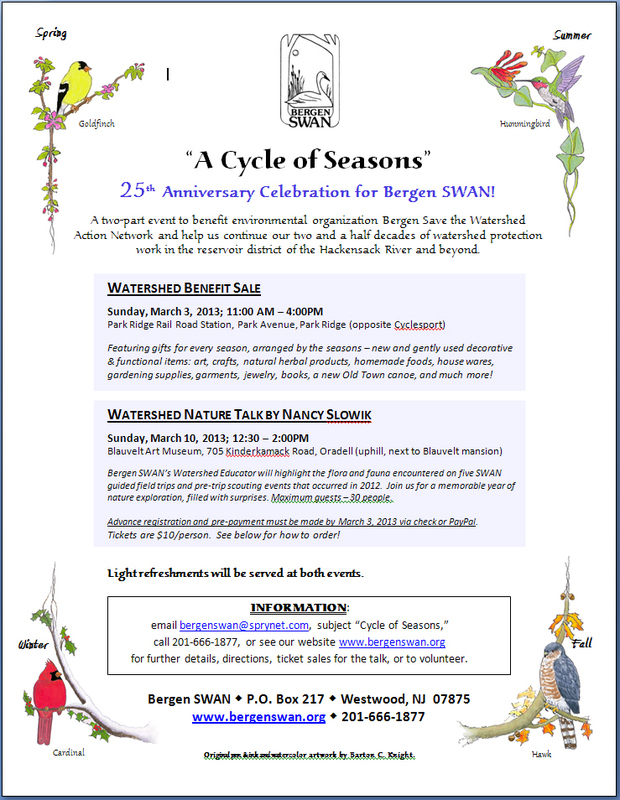 Bergen SWAN (Save the Watershed Action Network), the non-profit environmental organization dedicated to protecting the Upper Hackensack River watershed, is the organizing force behind this exhibit. 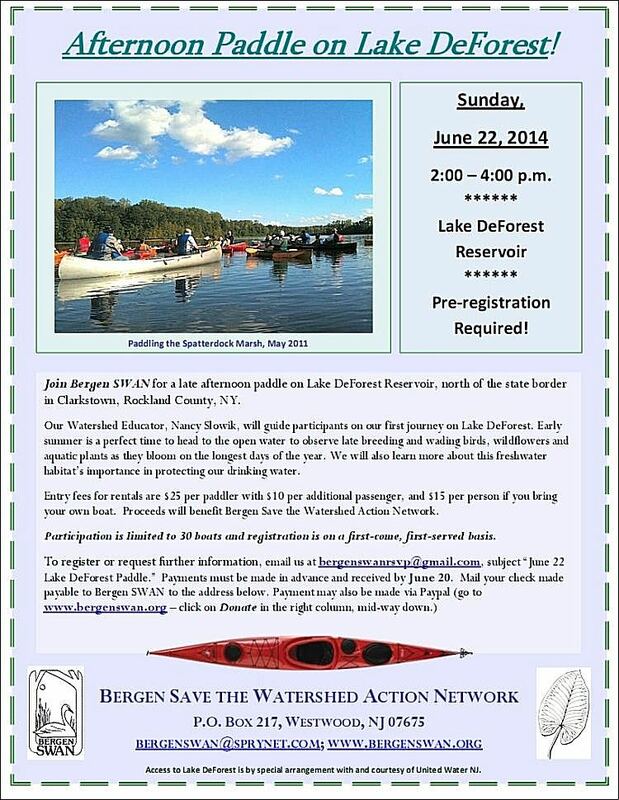 The organization’s primary focus has been the preservation of the natural lands surrounding the drinking water supply reservoirs in Bergen and Rockland counties. To date, they have been a major force in saving over 3,300 acres from residential and commercial development. The public is invited to come and meet the artists and environmentalists at a closing reception on Saturday, October 30 from 12-2 pm. A good glass of water will be among the many treats! For further information about this exhibit, please call Celine Ennis at 201-387-8879 or Barton Knight at 201-666-1877. 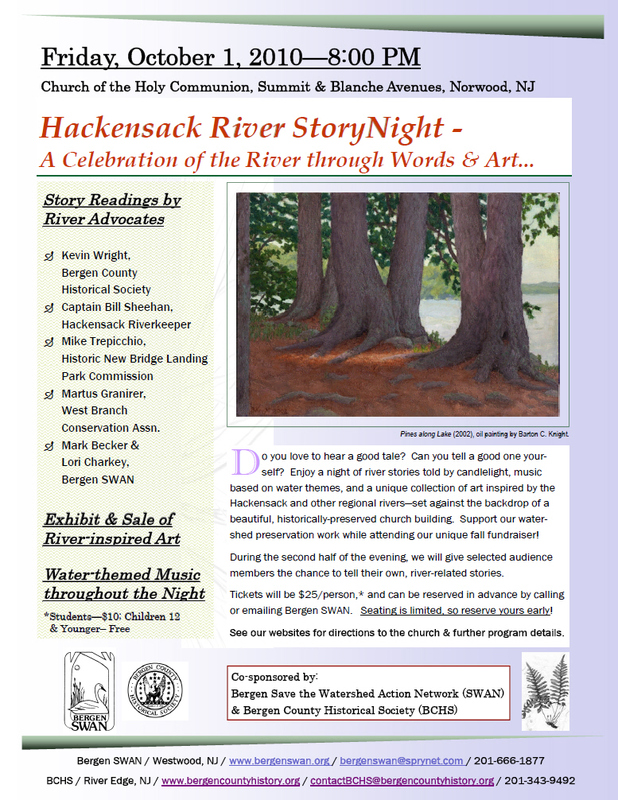 The first ever Hackensack River StoryNight promises to be a magical event that celebrates local waterways and honors the role they play in nurturing and sustaining our communities. 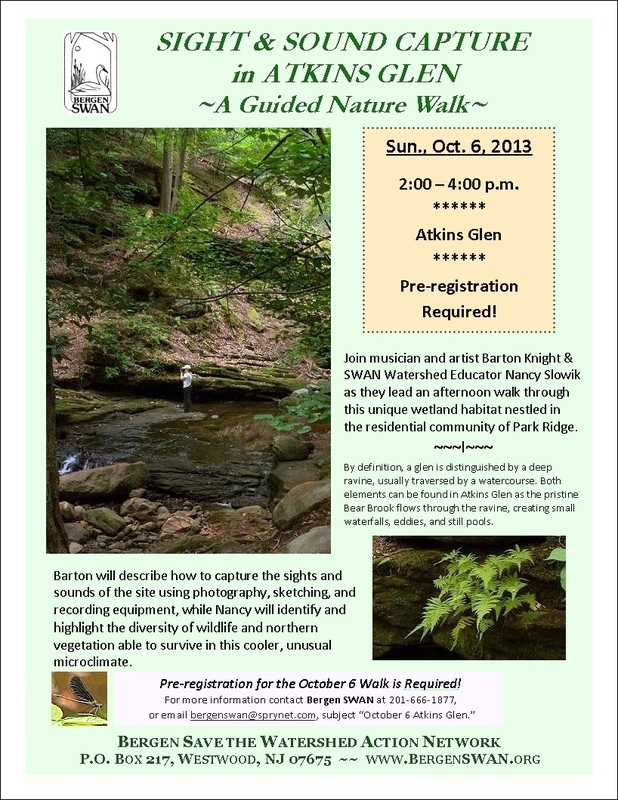 Against the setting of a beautiful old stone chapel and its scenic grounds, local river protection advocates will tell stories relating their experiences with the land and the people sharing our water resources. 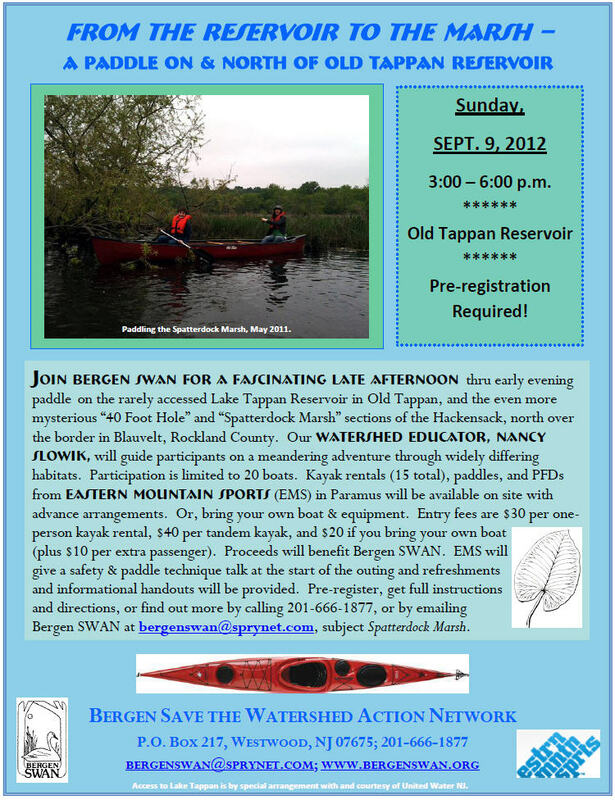 Performers Kevin Wright of Bergen County Historical Society; Captain Bill Sheehan of Hackensack Riverkeeper; Mike Trepicchio of Historic New Bridge Landing Park Commission; Martus Granier of West Branch Conservation Association; and Mark Becker and Lori Charkey of Bergen SWAN will regale the audience with their personal adventures that took place on one or more stream within the Hackensack River Watershed. 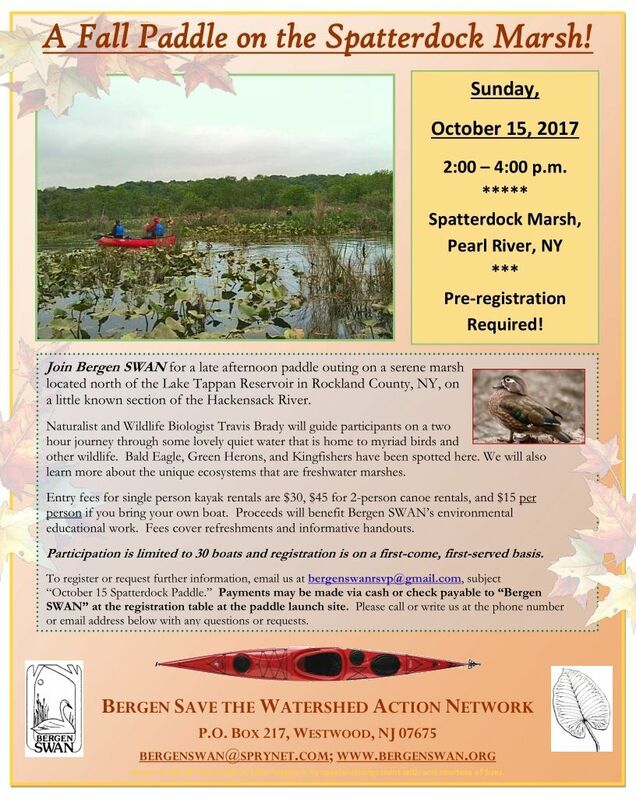 Between scheduled speakers, the evening's Master of Ceremonies, Greg Remaud of NY/NJ Baykeeper, will offer members of the audience the opportunity to share their own river-related stories. Throughout StoryNight, participants will enjoy water-inspired musical improvisations by renowned performers of acoustic music. 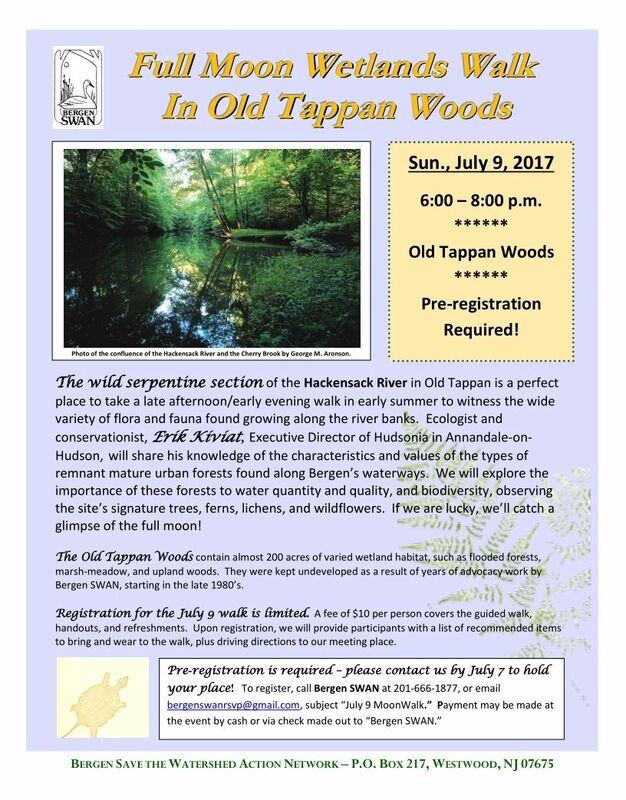 The musicians will play in concert with a soundscape of Hackensack River streams, waterfalls, and spillways, recorded this summer by Theatre Maker Will MacAdams, and Bergen SWAN's Barton Knight and Lori Charkey. 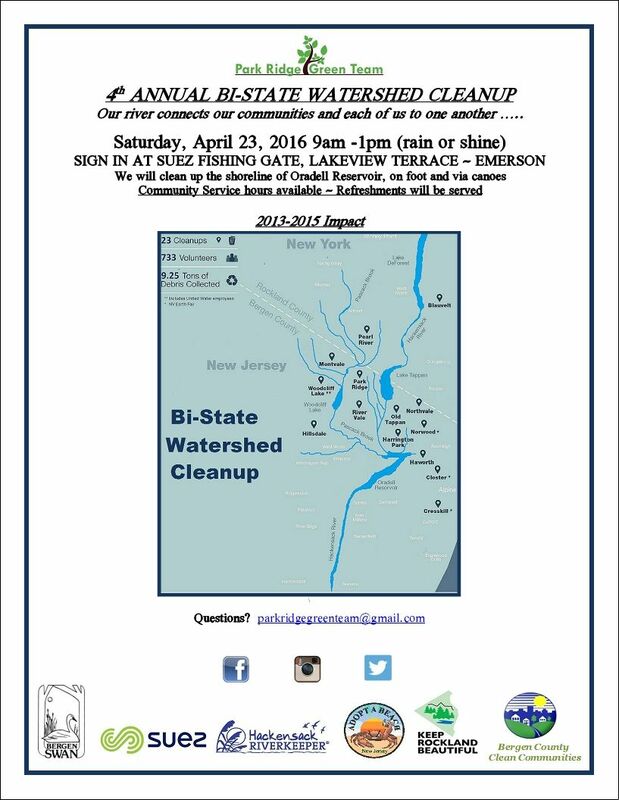 Providing another highlight of the event, several local artists will display and offer for sale works inspired by Hackensack R. watershed and other regional waterways. Weather permitting, the show's paintings, mixed media, photography, and mobiles will be set against the backdrop of the church's outdoor stone cloister and gardens on the night of the event, and will continue on exhibit throughout October at the Haworth Municipal Library. 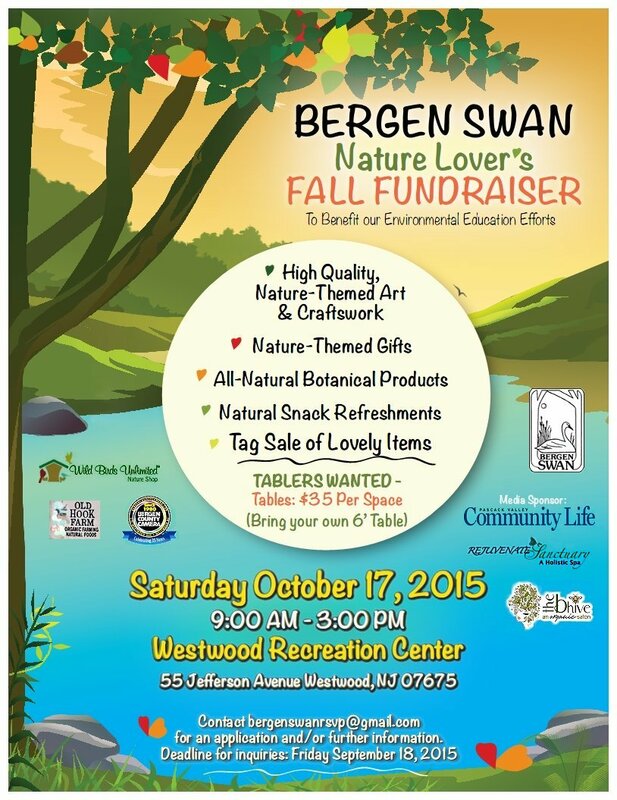 A portion of proceeds from sold works will benefit Bergen SWAN. 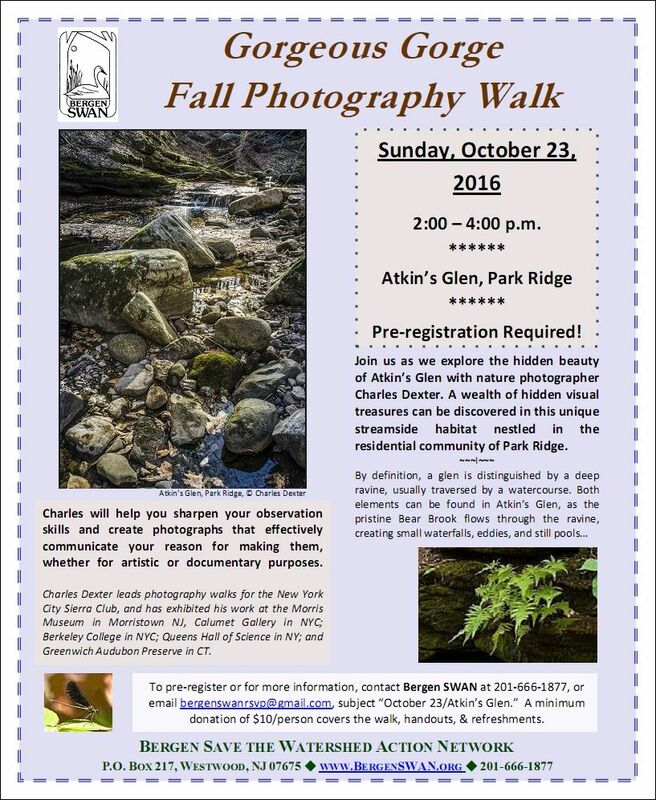 Click here for a downloadable copy of this flyer. Scroll down to find a description of the talks, speaker bios and directions to the site. 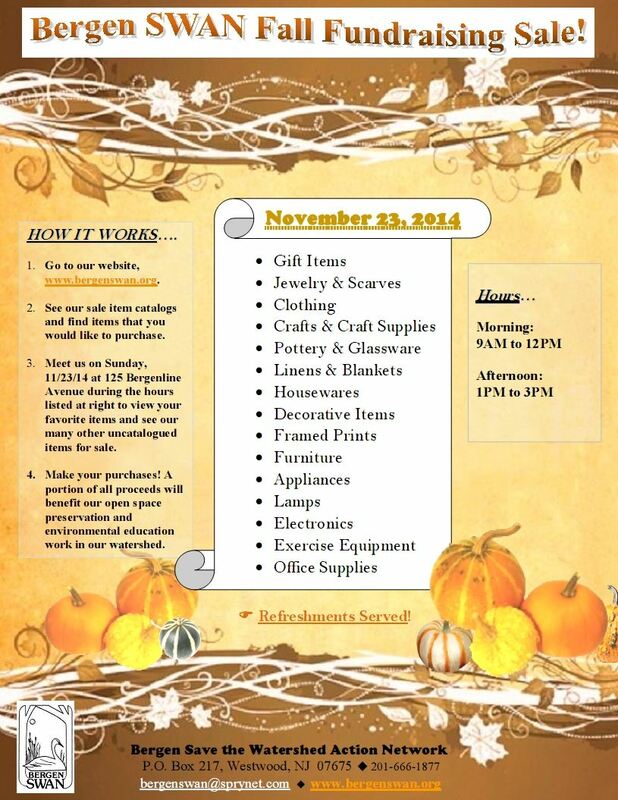 Click HERE to download a PDF copy of this flyer! The 2004 renovation of the Hungry Hollow Co-op food market was done with a commitment to ecologically sound landscaping practices. These practices are based on the use of native plants combined with landscaping that replicates the functions of natural swales and wetlands. At the Co-op, a 3,000-square-foot raingarden collects runoff from the parking lot and roof, while upland plantings closer to the building replace conventional turf grass lawns. 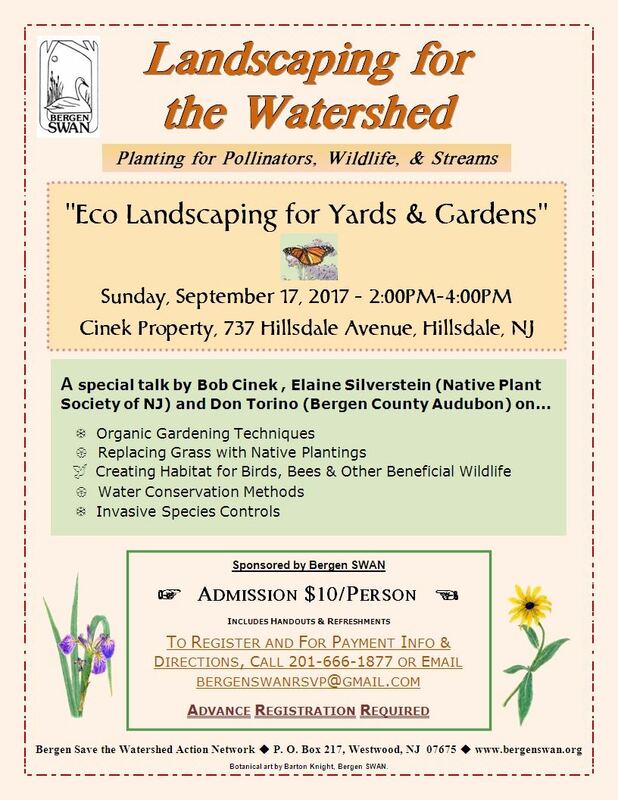 In this presentation, Ray Manacas and Bill Day of Threefold Educational Center will show how ecological landscaping principles can be put into practice - while covering raingarden design, construction, and maintenance. BIO: Ray Manacas is the Executive Director and Bill Day is the Development Coordinator for the Threefold Educational Center, a non-profit that develops and supports a wide range of educational activities that explore and enrich the human body, soul, and spirit. Based in Chestnut Ridge, NY, the Center manages 140 acres, using biodynamic methods. 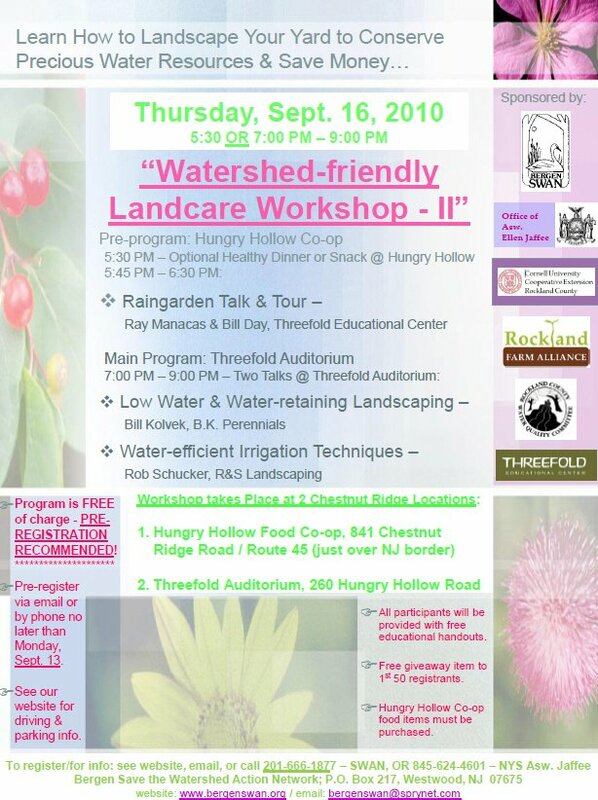 The raingarden at Hungry Hollow Co-op, part of the Threefold community, was featured on Bergen SWAN's 2009 Watershed-wide Eco Tour, in which Ray and Bill acted as guides for the site. Proper moisture assessment of a planting area and selecting appropriate plants is half the battle for success in landscaping. We will investigate a pallet of good garden plants that perform well on dry sites. We will discover and highlight certain plants that actually prefer low amounts of water. 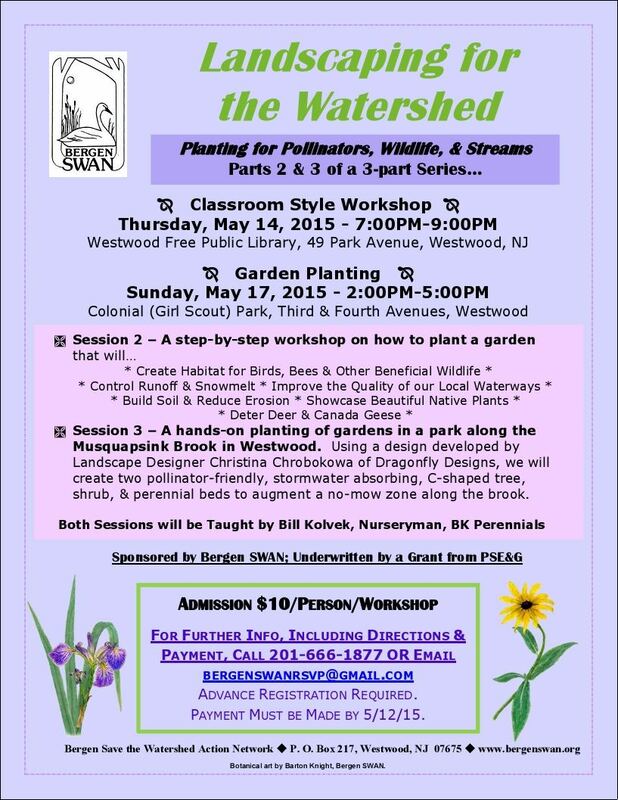 Participants will be given strategies for using these and other plants as alternatives to the conventional lawn. 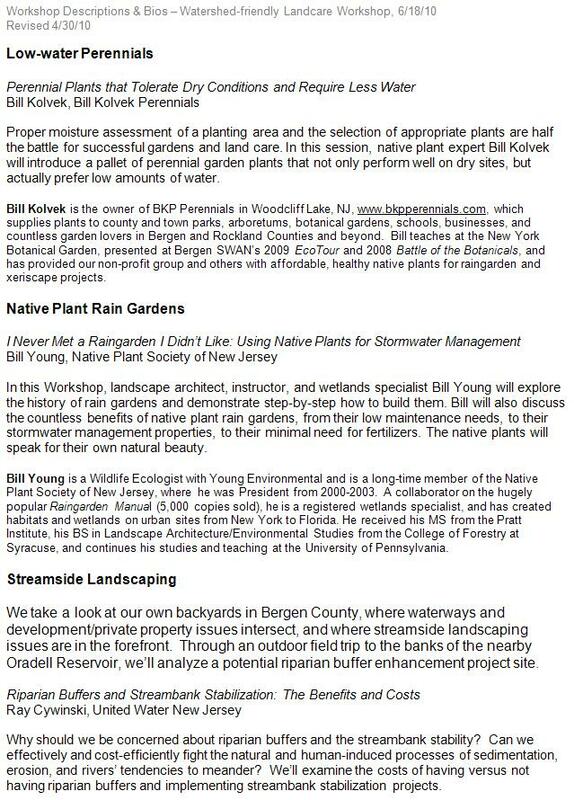 BIO: Bill Kolvek is owner of BKP Perennials in Woodcliff Lake, NJ, which supplies plants to county and town parks, arboretums, botanical gardens, schools, businesses, and garden lovers in Bergen and Rockland counties. BKP has provided non-profits with affordable, healthy, native plants for raingarden and xeriscape projects. The company has locally grown perennials, grasses, ferns, vines, and woody plants since 1987. 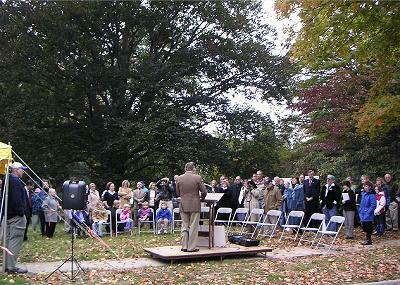 Bill lectures about ornamental grasses at the NY Botanical Garden. 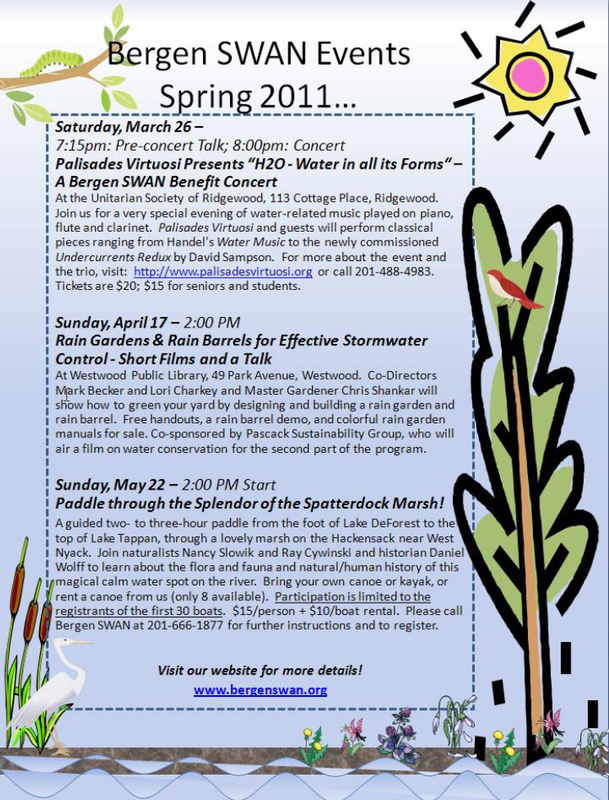 He presented at Bergen SWAN's 2008 Battle of the Botanicals, 2009 Watershed-wide EcoTour, and June 2010 Watershed-friendly Landcare Workshop I. An inefficient irrigation system can waste water and money each month, but did you know it can also cause plant and lawn disease problems? We will explain how you can avoid these costly situations by providing tips on when and how much to water to use to maximize the health of your plants. We'll explore the benefits of using low-cost, water efficient drip irrigation systems and discuss when and where to use this technique. 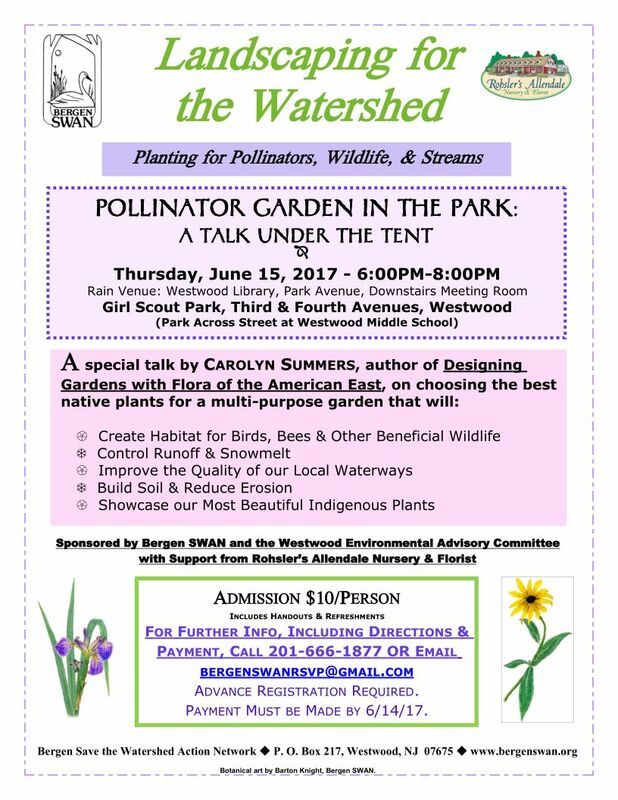 Participants will also learn about water-saving devices for a sprinkler system that can take the guesswork out of watering. Jack Daly is a volunteer with Cornell Cooperative Extension, specializing in water management and ecology. He served as an instructor for CCE's 40-hour AmeriCorps training week, and he is an adjunct professor in Sustainability Studies at Ramapo College. 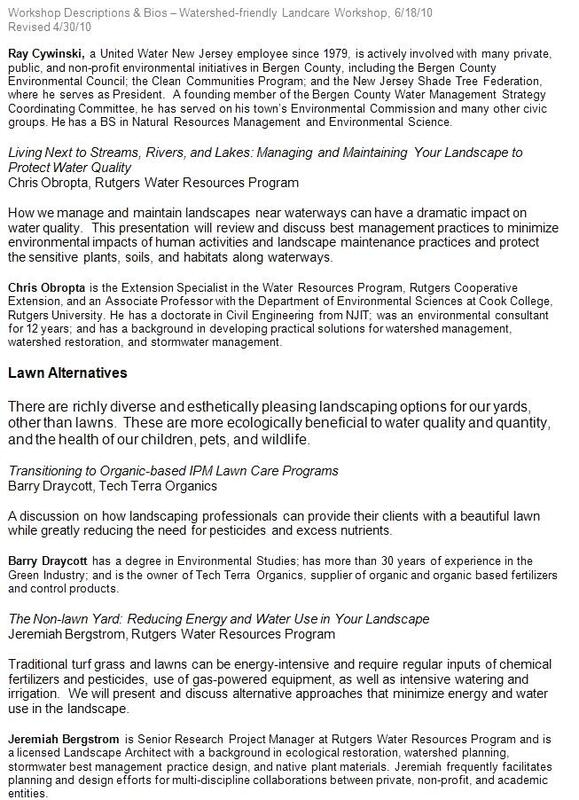 Click HERE to downoad the Watershed Friendly Landcare Workshop flyer and list of workshops & speaker biographies - also shown below. Click HERE for an interactive map and directions to the location of the event, or see the directions and map below. 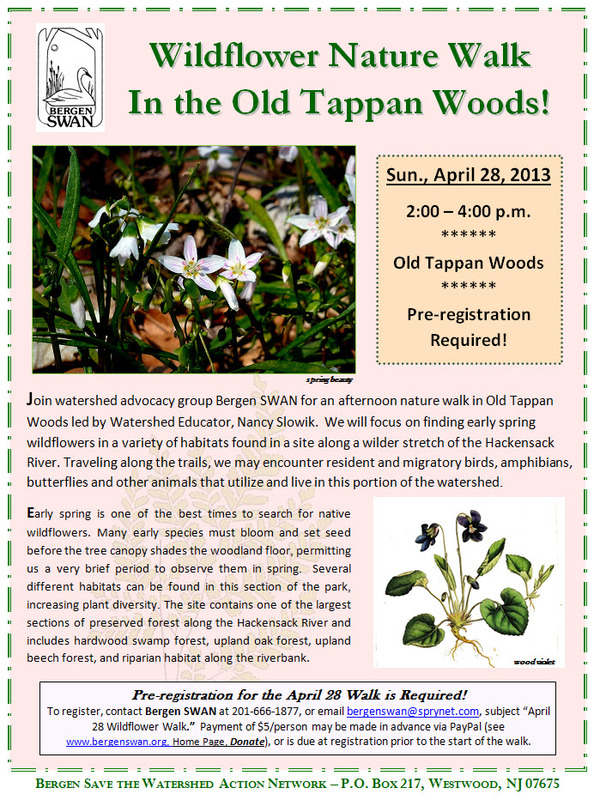 A downloadable and printable copy of this flyer can be obtained by clicking HERE! . 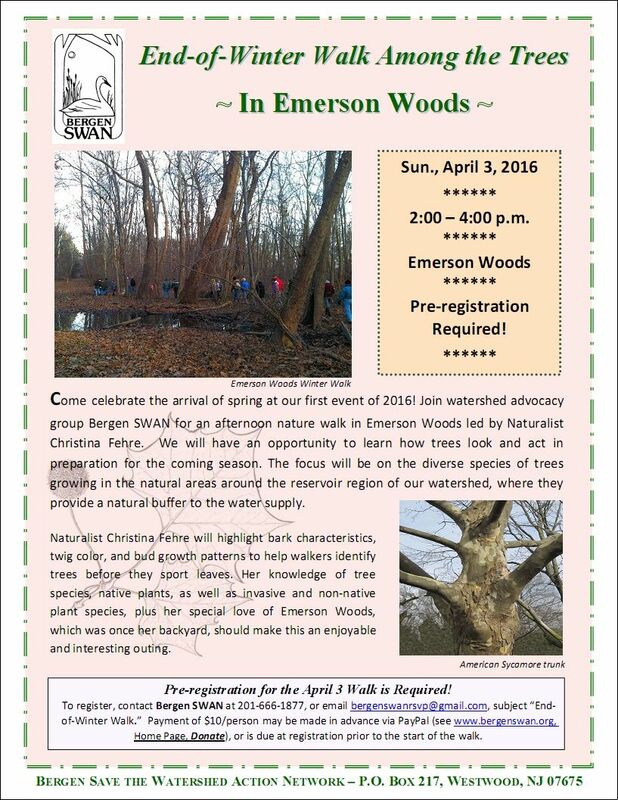 Click HERE to download a Volunteer Sign Up sheet. 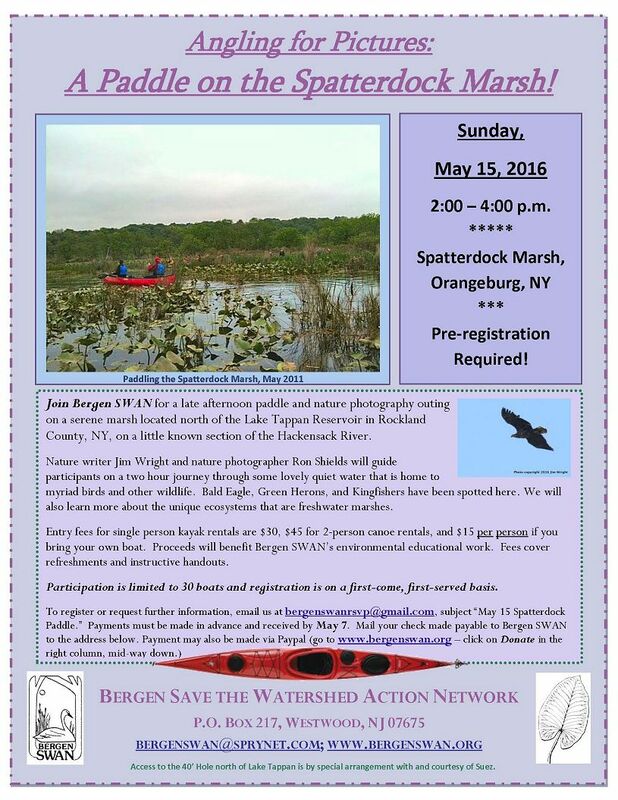 Please fill out the form on your computer and email to us at: bergenswan@sprynet.com. We will be planting a 10,000 square foot area around the central pond. We will have a tent set up not far from the entry area, which is where we will gather on both days. This will serve as home base for instructions, supplies, food, and information. We are looking for a handful of experienced hands that can act as Team Leaders, and be present for meetings in advance of the event and on the site prep/training on May 13-14. We will work all day on Saturday, and hopefully for only part of Sunday. 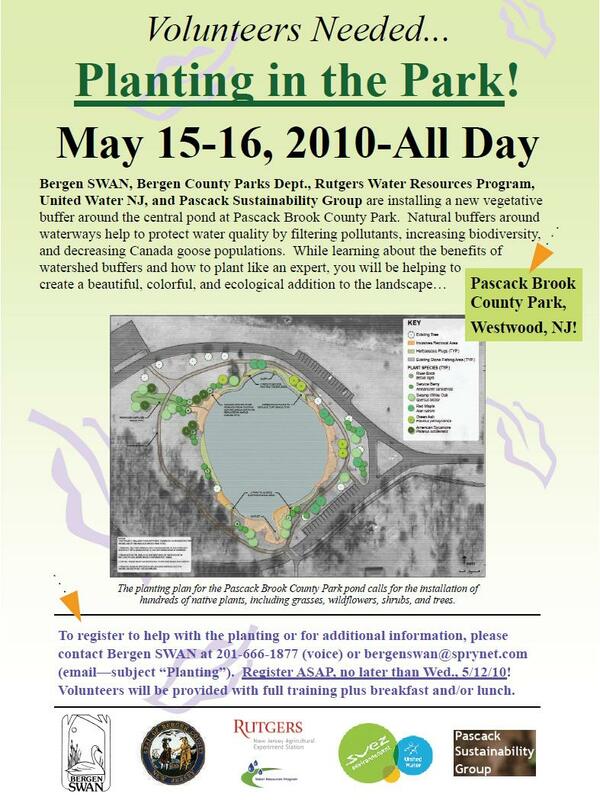 Regular "worker bee" volunteers should show up at the park on Saturday, May 15, starting at 8:30 AM. Sunday, May 16 will be our day for any overflow work and cleanup. We will try to give participants a break and start somewhat later on Sunday, depending on the workload. Volunteers will be provided with breakfast and/or lunch - whichever of these meals for which they are present. Volunteers can contribute as little as two hours' work or as much as two days' work - but we prefer those who can put in a solid 1/2 day or more of their time. The planting will take place regardless of the weather. Volunteers should wear seasonally- and weather-appropriate, comfortable, breathable clothing that they do not mind getting muddy, and bring a slicker in case of rain. They should wear comfortable, waterproof, non-slippery shoes that they do not mind soiling. Volunteers with physical limitations can help with lighter tasks. We will be planting seeds, plugs, container plants, and large balled & burlapped trees. We will be working with a landscape contractor in advance of the event to prep and stage the grounds. The landscaper's crew will make the ground ready and dig larger holes.